New observations of the Air Force's secretive unmanned X-37B space plane have put the spacecraft's classified mission back in the limelight. While many ponder the exact nature of such a vehicle, some experts have already gone on record questioning whether a robotic space plane is even needed. Perhaps the main unique advantage of the X-37B is the ability to return experiments or hardware to Earth for inspection, as Air Force officials pointed out before the space plane's launch in April. Only NASA's space shuttle currently has that capability, but the shuttle is slated to fly its final missions during the next year or so. Much of the uncertainty also rests with the program's unknown price tag. The space plane's long history includes not just Boeing Phantom Works as primary contractor for the U.S. Air Force, but also NASA and the Pentagon's Defense Advanced Research Projects Agency (DARPA). The main issue with the X-37B is a lack of a compelling mission, according to Grego and UCS colleague David Wright, who described their concerns in June on their UCS blog "All Things Nuclear." They also recently co-wrote "Securing the Skies" — a report that outlines 10 steps the U.S. should take to safeguard space. Other systems that don't return to Earth can carry payloads into orbit, maneuver in space, meet up with satellites, and release multiple satellites or other payloads at much lower cost, Grego and Wright said. The ability to bring a payload back to Earth represents a fairly unique capability for the X-37B. Yet the UCS researchers said satellite repair or recovery don't make much sense because of the X-37B's small payload bay, which is just the size of a pickup truck bed. By comparison, the space shuttle's payload bay could fit two entire X-37Bs inside. As for deploying space marines, the experts say forget about it. An X-37B's gliding approach for landing would make it easy prey for air defense systems, and hardly justify the high cost of dropping off a few fighters. "It's hard to think of what could make that mission compelling," Grego told SPACE.com. "It doesn't protect you from antiaircraft fire, and the element of surprise doesn't really work in your favor if you're launching on Atlas V [rocket]." Similarly, the X-37B represents a very unlikely carrier of missiles or other weapons because of its payload restrictions, costs and vulnerability as a slow, gliding bomber, according to the UCS researchers. Their assessment largely agrees with an earlier analysis by Brian Weeden, a former U.S. Air Force orbital analyst and now technical adviser for the Secure World Foundation. Weeden had rated the likelihood of a weaponized X-37B as "zero." An X-37B could reconfigure its sensor payload for each mission. That payload would depend upon the needs of a military commander or intelligence agency to peek at certain parts of the world, Weeden suggested. Having more propellant to burn per mission than a permanent satellite could also enable the X-37B to change its orbit, and therefore have the flexibility to change its coverage area on the fly. Finally, the space plane has a possible time advantage over a satellite launch mission in terms of preparations, Weeden said. Each satellite design has a unique way of "mating" with the booster rocket that carries it into orbit, which can become a time issue on short notice. Air Force officials might bypass that issue during an emergency by simply sticking whatever sensor payload into the standard body of the X-37B. Without knowing the exact costs involved (they're classified), much of the debate about the X-37B might also come down to viewpoints. Where the UCS researchers and even Weeden see a lack of any single compelling mission, the Air Force and the U.S. Department of Defense may savor the realm of possibilities. Weeden noted the Department of Defense has often favored such jack-of-all-trades systems during recent years. "The X-37B doesn't do one thing really well, but it does a lot of things," Weeden explained. "So in that sense, I can see the argument for it." Much of the speculation about the X-37B's reusability ultimately depends upon how well it performs during re-entry and landing. Such an automated plane-like landing would represent a first for the U.S. Air Force. Only the Soviet Union has previously demonstrated such an automated gliding return capability with its Buran version of the U.S. space shuttle. "From everything I know about it, it's not that much more advanced than the shuttle," Weeden said. "It's evolutionary, not revolutionary, with respect to the shuttle." Such a landing certainly has advantages for delicate or secretive military and intelligence payloads compared to a capsule parachute landing. "It's nicer to have it land on your runway than having to scoop it up in the ocean or from a landing in the desert," Grego admitted. Yet she and Wright at the Union of Concerned Scientists remain unconvinced that the costs justify the space vehicle. Whatever the X-37B's capabilities now, it started out as a fairly ambitious NASA project under the X-37 designation. NASA and Boeing signed a $173 million cooperative agreement to jointly develop the vehicle back in 1999. 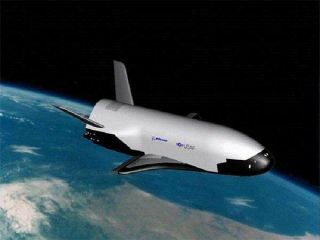 The Air Force took early interest in the X-37 as a possible space maneuvering vehicle, according to Susan Turner, former deputy manager for NASA's X-37 program. But the U.S. space agency had more interest in advancing the overall technologies of reusable space vehicles. The space agency aimed to include a whole new batch of technologies, Turner said. Those included the automated re-entry and landing system. NASA also wanted flight controls driven entirely by electromechanical actuators (EMA), which eliminate the bulky hydraulic circuits in normal control systems and take the approach known as power-by-wire. The X-37's braking system would have also incorporated EMA. New thermal tiles were required to protect the X-37 against the fiery heat of re-entry, because of its steeper inclination approach compared with the space shuttle. The heat load also rises because of the X-37's smaller size, which means less surface area to bleed off heat. So-called hot structures were planned for the ruddervators, which combine the elevators and rudder control surfaces that help steer an aerospace vehicle. The hot structures aimed to shrug off the re-entry heat load without requiring additional tiles or blankets for protection. "We were going to fill the sky with X-planes," Turner recalled. She is currently with the engineering directorate at NASA's Marshall Spaceflight Center in Huntsville, Ala. But the X-37 only managed to survive as a NASA project until 2004, when President George Bush announced his moon-centered NASA initiative that left no room for a reusable mini-shuttle vehicle. The X-37 space plane seen attached to the WhiteKnight carrier aircraft during test flight. Eventually, NASA transferred the X-37 project to the Pentagon's DARPA, which in turn handed off the project to the Air Force. once considered flying the predecessor X-37 as a secondary payload within the shuttle, Turner said. "[X-37] was always simply a technology demonstrator that didn't put people at risk, and cost less in theory than the shuttle," Turner said. She added that NASA also hoped at one point to use the X-37 as a long-duration orbital vehicle, which is not unlike how the Air Force may consider the X-37B. The X-37 could have also launched more often than the shuttle aboard an expendable Atlas or Delta 4 medium-class rocket. Such missions could have taken science payloads into orbit more frequently rather than get in the long line for a shuttle launch, and still take advantage of X-37's return capability. Similarly, NASA had interest in the X-37 as a reusable platform to fly hardware in space for testing purposes, so that engineers could know how well such systems fared. Those testing opportunities come rarely, Turner said. Cost and effort aside, Turner seemed glad the X-37 finally reached orbit as the X-37B, even as outside experts continue to debate its purpose and cost-effectiveness as an Air Force vehicle. "I always tell people it's hard to kill a good idea," Turner said.